In 2-quart saucepan, heat Mostarda ingredients except mustard to boiling over medium-high heat. Reduce heat to low; simmer uncovered, stirring occasionally, until cherries are plumped, apples are tender, and liquid is reduced, about 30 minutes. Remove bay leaf; stir in 2 tablespoons mustard. Let cool. Meanwhile, heat oven to 375°F. Line rimmed baking sheet with foil. In small bowl, stir 3 tablespoons mustard, the garlic, 1 1/2 teaspoons salt and the pepper together. Rub mustard mixture all over pork. Place pork, fat side up, on baking sheet. Place pancetta in overlapping slices on top of pork roast. Roast 50 minutes to 1 hour 10 minutes or until thermometer inserted into center of pork reads 145°F. Remove from oven; let stand 10 minutes. 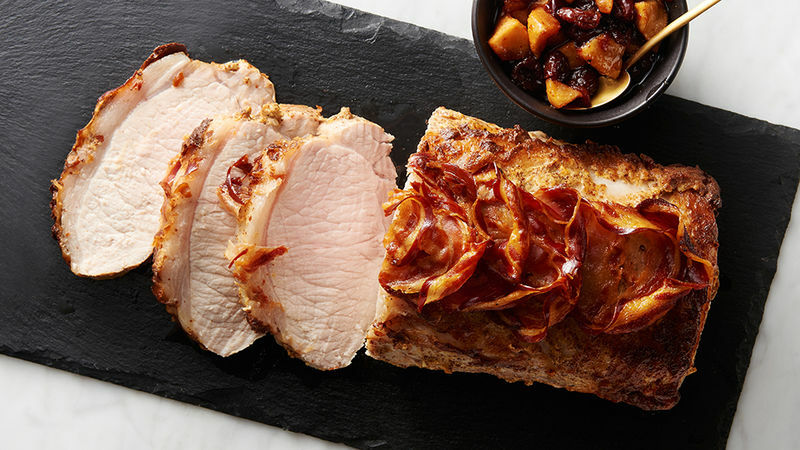 Slice pork crosswise into 1/2-inch-thick slices. Arrange pork slices on platter. Serve with mostarda on the side. Country-style Dijon mustard is a cross between whole grain and Dijon mustard. It provides a little texture to the mustard while still delivering the flavor of Dijon. Substitute regular Dijon if preferred. The mostarda can be prepared up to 2 days in advance and kept covered in the refrigerator. Leftover mostarda makes a terrific spread for turkey or pork sandwiches.